Leo kept a studio right in the thick of the action on Oxford St, Sydney after relocating there from Brisbane in 2000. From there he could look out the window onto the constant hubbub of one the most colourful ends of town. He shared the space and good times with a group of artists who had immense drive and passion. They were a great inspiration to him. Pivotal in his desires to pursue his artist visions was the discovery of a loose international community of visionary and surreal inspired artists. This brought him into contact with the Art Visionary magazine and the Society for the Art of Imagination, and many other artists. He therefore resolved to travel to Europe where much of the focus was. Leo left for Europe in 2003 and made a studio in Berlin where he set to work produced new works inspired by his new surroundings. He also had the chance to meet with artists affiliated with the Vienna School of Fantastic Realism. In Vienna he met Fantastic Visionary artists, De Es Schwertberger, Peter Gric, Luigi La Speranza and a number of other artists who inspired him. It was here he could observe and ask these artists of the techniques of the Old Masters. Upon returning to Berlin he began to practice and explore what he had seen in Vienna. His time in Berlin was very productive and great learning experience, artistically and from life. In his time there he learnt to speak German. Through this he learnt what is like to be a foreigner, and came to love it. He met other artists who were sharing the same experience. Together they formed a small community that supported each other in their trials and tribulations, and then celebrated their successes. Some of the successes he experienced while in Berlin did not actually take place there. He had artwork toured back in Australia, published in Chile, and exhibited in London. In 2005 Leo started building the immensely popular beinart.org website for Jon Beinart. In the following year Leo relocated to London to seek out new opportunities and experiences. 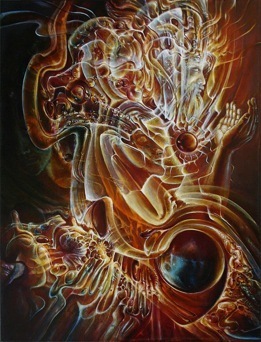 In 2007 his artwork was published alongside some of the greats of Fantastic Visionary art in Jon’s book Metamorphosis. Working with Jon Beinart and being published in his book has brought Leo into contact with a truely global network of artists. Later in that year, Leo came into contact with Shoji Tanka and the International Fantastic Art Association (IFAA) in Japan. In April 2008, Leo was invited along with Luigi La Speranza to exhibit with the IFAA in Kyoto.